There is not that much to the 2015 Funko Pop Exorcist Vinyl Figure set, but just like the famed horror movie, a little goes a long way with The Exorcist. 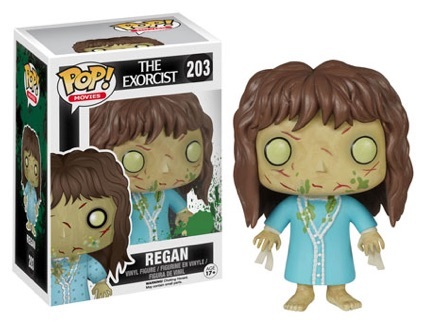 Featuring only Regan MacNeil, the possessed 12-year-old girl played by Linda Blair, the Funko Pop Exorcist figure opts for her demonic state with green eyes and a scarred face. It also features splashes of the iconic pea soup vomit. The end result is definitely more creepy than cute. Showcasing a similar overall design to the other Funko Pop! figures, the Funko Pop Exorcist detail leaves no confusion about what you are looking at. Audiences and horror films have long enjoyed a strong relationship, but The Exorcist broke the mold. As the first horror film to be nominated for an Oscar in the Best Picture category, the 1973 release still holds a special place in cinematic history. The 2015 Funko Pop Exorcist Vinyl Figure is included as part of the Pop! Movie series.